Cape Coral Florida news and information. Last week we reported early signs point to a Southwest Florida real estate market shift. The article went on to state that we’re noticing changes in the market, but nothing alarming. It’s not alarming because real estate markets are constantly in a state of change. 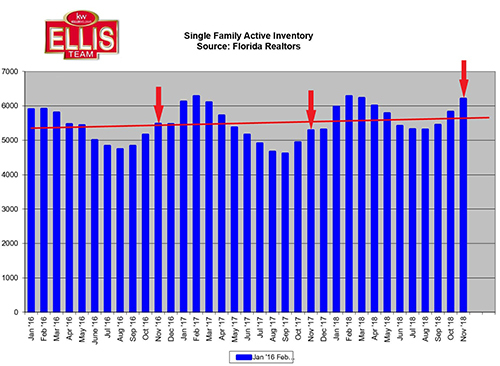 Southwest Florida real estate inventory rises in January. 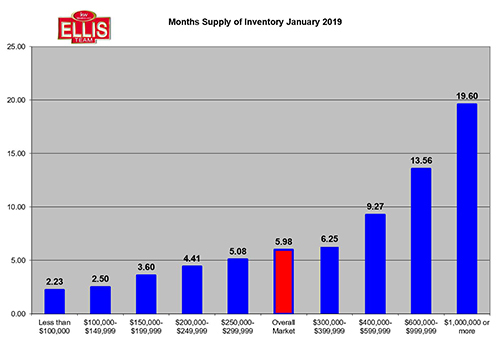 One definition of a balanced market is 5.5 months’ supply of inventory. We’ve seen others that state 6-7 months is the standard. 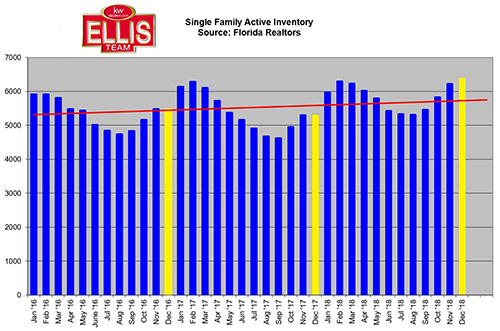 If we go with the Florida Realtors standard of 5.5 months, then officially we just transitioned over to a buyer’s market, but just barely. Last month in December we had a 5.43-month supply. In January it stands at 5.98 months. Lee County available listings shot up to 6,542 in January, up from 6,004 in December. That’s a 9% rise in just one month. That’s typical in January as more people put their homes on the market in January than December. The difference this year is that more people than usual also put their home on the market in November and December. Home sales are picking back up again. This past week the Ellis Team put 4 of our homes under contract in one day. In fact, 314 homes went under contract this past week in the MLS. We tell people sales usually pick up after the middle of January, and they have. If 5.5 months supply of homes is the cut-off between a buyer’s market and a seller’s market, we’d say we’re fairly balanced at 5.98 months. However, the market is moving and if you’re selling a home you need to know the trend. This trend could change back again by end of season as homes start flying off the shelves and new listings taper off. In any event, hiring a real estate professional who understands the market, and brings significant experience in all kinds of markets is critical. You don’t want to hire an agent to sell your home who has never experienced a shifting market. This is the quickest way to becoming an expired listing, and the process isn’t quick. Why wait to sell your home when you could have just sold it correctly the first time? There’s another adage that says, “If you think hiring a professional is expensive, just wait until you hire an amateur!” Most people want to hire the least expensive agent they think they can get away with. The thinking goes, if I pay less, I’ll probably net more in my pocket at closing. That stands to reason, except for the fact that it isn’t true. Sometimes you get what you pay for, and in some cases, you get much more than you pay for. The Ellis Team at Keller Williams Realty has a history of selling homes faster and for More Money! The agent you select really makes a difference. 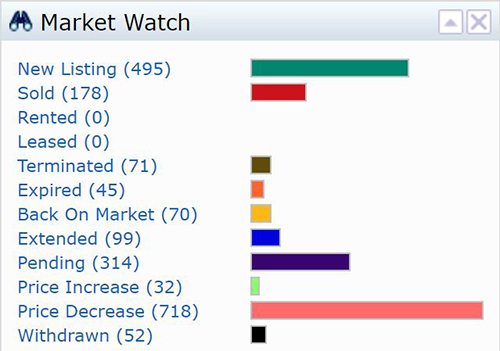 We hope you find our market updates informative. We believe knowing the market is helpful to make the best financial decisions for you and your family. Knowing that your agent cares about you, knows what’s important to you, and knows how to get you there is key as well. Posted in Cape Coral, Cape Coral Real Estate, Fort Myers, Fort Myers Beach, Fort Myers Real Estate, Open House, Southwest Florida Real Estate. We don’t want to alarm you as 2018 turned in some impressive stats in the SW Florida real estate market. Closings were up for the year, as were prices and dollar volume. You would think with increased closings and prices, Realtors would be reporting the market is fantastic. 4th quarter numbers suggest there may be some chinks in the armor. Early signs point to a Southwest Florida market shift. Closed home sales fell 15% in December over last year. We can attribute some of that to increased closings last year in December due to Hurricane Irma. However, we’re seeing new pending sales down 10.9% in December, which will lead to lower closings in January and February of this year. The median sale price rose 3.1% for the year and ended at a year-end average of $251,000. The average sales price rose 5.6% to $351,200 year-end average. So, if prices are rising, why are we sounding the alarm? Inventory rose 8.8% for the year. 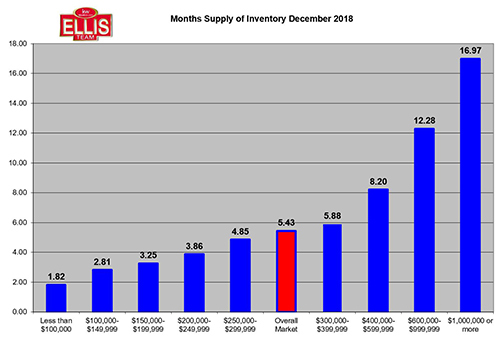 However, inventory shot up 19.8% over last December and the month’s supply of inventory was up 11.8% in December. While sales for the year may be up, we’re seeing declining sales in the 4th quarter, rising inventory, and a decrease in new pending sales. All this leads to worry amongst real estate agents that we may be in the middle of a shift. This isn’t a time to worry though. Experienced agents know how to handle a shift. If you’ll remember, our article back in October warned of a possible upcoming shifting market, and we recommended sellers put their home on the market before January to beat the predicted rush of listings. When the market shifts, it’s critical you select an agent with experience. For instance, lower priced homes are still receiving multiple offers. Other homes take more marketing and experience to sell properly. Of course, you not only must select an experienced agent, you must listen to them. Sellers do not like to hear that the market has shifted, and they hold onto what their home used to be worth. Markets move up and down, and just as a seller expects a buyer to get over it when the market moves up, buyers expect sellers to get over it when it moves down. 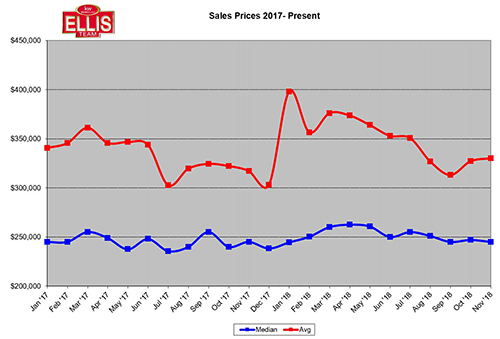 Sellers point to the fact prices went up 3.1% in 2018. Yes, but not in all sub-markets, and not all year. Prices may have gone up slightly in first 3 quarters of the year and pulled back in last quarter. Some say it’s rising interest rates. Interest rates peaked in October around 5%. They’ve since slid back a bit. Rising rates rob home buyers of purchasing power. As this occurs, there are fewer home buyers available in each price range. Keep this in mind. Inventory levels stand at a 5.7-month supply of homes. A balanced market is 5.5-month supply. So, we’ve barley crossed the threshold, and it varies by price range. 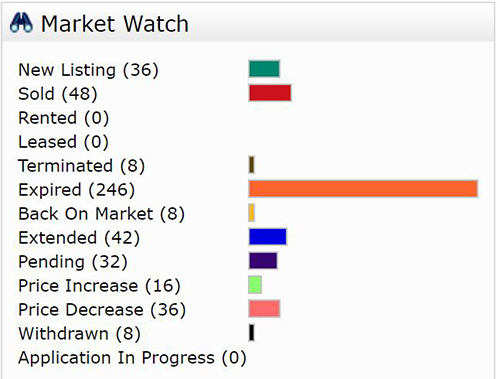 We’re seeing buyer activity picking up right now. We usually do after January 15th. Buyers have more choices today, but the best homes are flying off the shelves. The challenge to sellers is, you must be the best home, so buyers pick you. An experienced agent can guide you. Buyers see lots of homes, and it becomes apparent which is the best value for them. Sellers must learn to think like a buyer. Posted in Cape Coral, Cape Coral Real Estate, Fort Myers, Fort Myers Beach, Fort Myers Real Estate, Open House, Reflection Lakes, Southwest Florida Real Estate. Has Government Shutdown Affected Mortgages and Closings? The Ellis Team was supposed to have a closing December 31. We represented the seller. The buyer selected a lender from CA who gave a pre-approval letter. It turns out, the buyer had no chance of closing with that lender. They said they were just waiting on IRS tax transcripts, and since the government was shutdown, they had to put the loan on hold. So, even with IRS transcripts, the loan would never have closed under the program they selected. Has government shutdown affected mortgages and closings? Upon missing the closing date, we decided to get a lender we use regularly involved. The buyer agreed, as they wanted to buy the home. Our lender looked at the file and said they would not qualify, even if they added a co-borrower. However, if we switched them to an FHA loan, we’d have a chance as they are more forgiving on loan ratios. 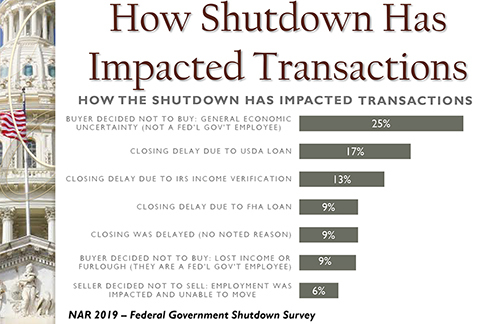 Many lenders cannot do a FHA loan with a government shutdown. Many lenders can’t do a loan without an IRS transcript. We were able to get an FHA loan in 13 days, bypass the transcript issue, and get flood insurance, all during the government shutdown. How did we do it, and in 13 days nonetheless? It took some hard work on everyone’s part, especially the lender. We worked with a direct endorsement FHA lender who does not need an FHA underwriter to approve the loan. Secondly, they made this loan a priority for us. Lastly, we had the buyer assume the seller’s flood policy, so we were good to go, even amidst a government shutdown. Both buyer and seller were ecstatic. We could not have done it without the help of our lender, title company, and a buyer and seller working together to make it happen. So, let’s give you an update on how the government shutdown is affecting other real estate closing throughout the country. Flood Insurance – FEMA announced on December 28th that they would resume selling new policies and issuing renewals again. IRS Tax Transcripts- Many top lenders are waiving IRS (4506-T) tax transcript verifications to fulfill a loan as they are unavailable now. Nationally Realtors say that 9% of transactions involve a federal employee and the transaction is on hold. 13% have been impacted by the transcript issue, although there are workarounds for this with certain lenders. The bottom line is the government shutdown isn’t having a huge impact on closings yet. Any disruptions in closings can have a large impact on the overall economy as real estate generally impacts about 32% of GDP. In uncertain times it pays to work with real estate professionals and lenders who have a track record of solving issues as they pop up. Good Realtors know who the good lenders are. Inventory has been rising, so selecting a professional who will market your home and make it stand out is important today. Hopefully that same agent also knows how to get the home closed once they find a buyer, because in a rising inventory environment, you never want to have to sell the home twice. It pays to get the home closed the first time. If you’re looking to buy a home, give our team a call. We can get you pre-approved and get your home closed. Just because a lender approves you doesn’t mean they can close you. Experienced agents know that a mortgage pre-approval does not mean you have a guaranteed closing. We can get you working with a lender with a track record of closing loans. If you’d like to search for your dream home, check out www.LeeCountyOnline.com It has all the homes on the MLS, and it’s updated every 5 minutes. No more missing out on hot new properties because the site you’re using doesn’t have it. If you’re thinking of selling your home, always call Sande or Brett Ellis 239-489-4042 Ext 4. Brett and Sande handle the listings on the team. Let us show you how our marketing will set you apart and get your home to the closing table. 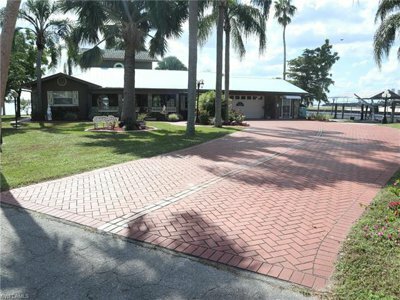 Posted in Cape Coral, Cape Coral Real Estate, Fort Myers Beach, Fort Myers Real Estate, Gated Community, Reflection Lakes, Southwest Florida Real Estate, Waterfront Homes. Today’s home buyer loves to search online to find their dream home. It makes them feel part of the process and gives them a certain sense of control, which makes sense because they are half of the process. Without home buyers we wouldn’t have home sales. Home buyers demand 360 degree virtual tours and artificial intelligence. Most buyers realize they can’t complete the purchase alone, they need help. The one thing they can do though is search. And when they search, and search, and search the process can sometimes be overwhelming. We’ve seen buyers bring in a stack of listings or email us daily with homes they feel they might like to look at. Their frustration mounts when they see a few of these and realize they don’t match their criteria at all. They’re also afraid they might be missing out on some listings because they can’t quite tell if the property meets their needs based on the photos. The technology is here today to show them so much more, and buyers love it. The Ellis Team is employing two sets of technology we believe will really change how buyers look at property, and how Realtors market their listings. We’re introducing artificial intelligence that searches each photo in the MLS and keeps an eye on what a customer likes online. Let’s say a customer is searching for homes 1800-2100 Sq. Ft of living area, with a pool, 2 car garage, and at least 3 bedrooms. What the system notices is that they seem to be drawn to homes with wood floors, or white kitchen cabinets. They didn’t ask for it in the search, but it’s clear they spend more time looking at homes with the two features. We’ll be able to suggest homes that match what they’re looking for, even if they didn’t specifically ask for it. Realtors, how many times has your buyer bought a home completely different than what they told you they were looking for? Exactly! Our artificial intelligence will be able to search neighborhoods for features like parks, recreation, proximity to shopping, restaurants, etc., in addition to photos. We have neighborhood insights that causes buyers spend over 4 times looking at homes with these insights versus ones that don’t. 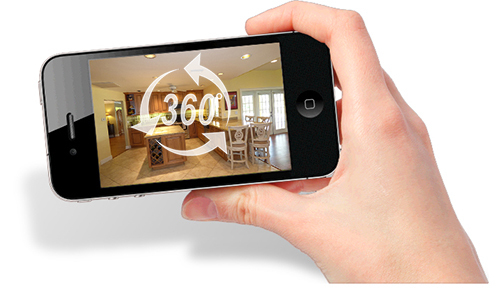 The Ellis Team is adding 360 degree virtual tours on our listings. www.SWFL360hometours.com By doing this the buyer gets a greater sense of the home in proximity to the neighborhood, and a sense of how each room looks and feels in the home. A static photo can be shot in such a way as to make the room look different than it really is, and buyers don’t like that. They feel like they’ve wasted their time when there aren’t enough photos of a home, or they feel deceived. A 360 degree virtual tour puts the buyer in control of how they want to view the home, and they are much more likely to schedule a live showing because of that. We had a home listed with static photos. It wasn’t selling. As soon as we loaded a 360 virtual tour, a buyer called us to schedule a showing. They had a better sense of how they could use the property. They bought it, and both buyer and seller are happy. The static photos weren’t bad, they just couldn’t tell the buyer the whole story on how they could use the property. This is all part of a greater marketing strategy. Giving the buyer the tools to be more engaged in the buying process makes a Realtor’s listings stand out. In an age of increasing listing inventory, Realtors need to do more and more to make their listings stand out. The 360 virtual tours are live now and growing as we list properties. Artificial intelligence searches are set to go live in SW Florida by March. If you’re thinking of selling and would like to see how all this works for you, give Brett or Sande Ellis a call. 239-489-4042 Ext 4 We’ll be happy to show you how the Ellis Team can make your home stand out, and how the new technology that will absolutely change how Realtors sell certain homes faster and for top dollar. Did you know that January 1st is the biggest expired listing day of the year? It is, and this year we had 246 residential listings expire on January 1 in Lee County. If you made your 2019 New Year Resolution to sell your Home, we’ve got some tips for you to make that happen. Listings fail to sell for two primary reasons. They are priced incorrectly, or they aren’t marketed correctly. Sometimes it’s both, but it’s definitely one of those. These are both easy fixes, if you’re serious about selling. The seller sets the price, and the market determines the value. If your price is over the market, the market will tell you. You may not like the market, it just is what it is. The good news is, if you don’t like the market, it may be a buying opportunity on the back-end. Most sellers sell one home and purchase another. If you wait to sell your home until the market goes up, chances are the next home you are buying goes up too. Add in rising rates, and waiting could cost you much more than trying to hit a certain number. We all want as much money as possible out of our home. You might need a certain amount to make the move. The market never cares what a seller needs, it only cares about today’s value. And it could go up or down from today. Enough on price. Let’s focus on marketing. One reason sellers don’t want to reduce their price is because they think it might be the marketing. Why reduce price when it could just be a matter of reaching the right people? To get Top Dollar you must reach the right people, at the right time. Putting a home online and in all the big listing websites won’t do it. This assumes your buyer is searching on one of those sites and can find your home in the clutter of all the other homes listed online. It becomes a rush to the best price per square foot. We know your home is worth more because it has a better location, better kitchen, a pool, and several other things some of the other homes don’t have. Of course, your home will have a higher dollar per square foot than those homes. And it should! Listing your homes on these websites is the Lowest form of marketing there is. Any agent can do that, and that may be all they do. What if you could stick ads onto web pages that match exactly what a buyer is interested in? You can’t, but we can. If you have a waterfront home, we have the ability to advertise to waterfront buyers. The same with golf course properties. Whatever your home has, we have the ability to market straight to buyers with those kinds of interests. This is in addition to the print marketing and all the other marketing the Ellis Team does. You see, it really does make a difference who you list your home with. All Realtors are not the same! Therefore, we say either of these two reasons are an easy fix. We’ll help you determine if your price is correct. The Ellis Team will show you how we reach buyers specifically for your home. Yes, we still do signs and newspaper ads, and that too might sell your home. But that’s not all we do, and there is a difference. Our marketing really works, and nobody else does everything we do. We’re sure of that. If you’ve made your 2019 New Year Resolution to sell your Home, you should call the Ellis Team at Keller Williams Realty. We make your 2019 resolutions to sell your home come true. Let’s make 2019 your year. Check out www.SWFLhomevalues.com if you’d like to get an idea online for free of what your home is worth, or call Sande or Brett Ellis 239-489-4042 Ext 4 to get your home sold fast! Thinking of Selling Your SW Florida Home? Posted in Cape Coral, Cape Coral Real Estate, Fort Myers, Fort Myers Beach, Fort Myers Real Estate, Reflection Lakes, Southwest Florida Real Estate. Lee County home prices haven’t budged since December 2016. As you can see by the graph, median home prices in November 2018 stood at $245,000. Median home prices in January of 2017 stood at exactly $245,000. Average home prices this November came in at $330,100. Average home prices back in January of 2017 were $340,604, so average prices declined over $10,000. Many sellers in Lee County believe home prices have been going up steadily the past few years, and they really haven’t. Lee County home prices steady as listings rush to market. We’ve been telling readers not to wait until season to put their home on the market, and people listened. Each January there is a rush to list homes on the market. This season will be interesting to watch as the rush has already begun. If you look at this year, you’ll see a spike in listings beginning in October and continuing into November. What’s going to happen this January? Did the rush to list begin ahead of schedule, or is there another normal wave coming? We believe there is another normal wave coming which will further increase our inventory supply, but we’ll wait and see. If there is another wave coming, this will temper future price increases as inventory rises. We already have pressure on prices due to rising interest rates. Now we’re getting pressure from rising listing inventory. The good news is we have rising sales. Closed sales were up 12.2% in November over last year. New pending sales were down 20.1% in November and total pending inventory was down 20.3%. This is a future sign for closings in December and January. We had a spike this year in January closings, and that was due to a high number of pendings in November 2017. Keep in mind we were just getting the market cranked back up after the hurricane last year, so that may have accelerated sales into January of this year. The key to buying in this market is sorting through all the inventory and viewing the best ones. The best listings go fast in any market, and the rest sit and linger on the market. Don’t forget about listings that have been on awhile and recently reduced their price to get in the game. These are just like brand new listings. They were invisible to the market before because they were priced to high. Once they reduce down to where the market is, buyers will scoop them up, assuming they’re marketed correctly. Sellers are often reluctant to reduce their price because they’re not sure if it’s the price or the marketing. Sometimes they want to try changing Realtors first, then go to price. I really wish sellers would do a better job selecting their Realtor upfront. Not all Realtors market the same and this can make a big difference exposing their home to all of the market, not just a select few. Because some sellers believe all Realtors do the same thing, sometimes they choose a Realtor with the lowest commission. Why pay more if you get exact same service, right? This couldn’t be further from the truth. Now back to the buyers. Sorting through all the listings can be challenging. Buyers love our website www.LeeCountyOnline.com because it has all the listings, not just some of them like other big websites. It’s updated in real-time too, so you’re not looking at old data with old prices, or listings that are sold. Speed wins in the home buying game. The good deals are easier to land when you have the information first! Buyers love saving their search, so when a listing has a price change, or a new one enters the market, our buyers have an advantage. Our website is Free, and easy. If you’re thinking of selling, call Sande or Brett Ellis 239-489-4042 Ext 4. We’ll show you how the best marketing plan can sell your home faster, and for top dollar. Whether you’re a buyer or seller, we’ve got you covered. Thinking of Selling? Find out what your SW Florida home is worth online for Free. Posted in Cape Coral, Cape Coral Real Estate, Fort Myers, Fort Myers Beach, Fort Myers Real Estate, Southwest Florida Real Estate. 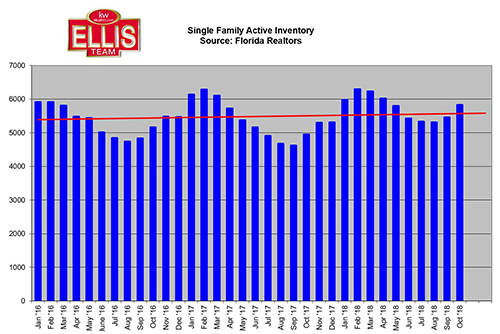 News that Lee County housing inventory supply rises heading into 2019 season won’t surprise many Realtors, but it may shock some sellers. Reading headlines in 2018 would leave many sellers to believe the Lee County housing market is up and doing well. Let’s dive in and look at some numbers. Inventory is up in every single price category since October. We saw a 17.24% rise in listing inventory and only a .77% rise in sold homes since October numbers were released. Since these are 365 days numbers, the buildup in inventory has essentially occurred since October. We have 883 more homes on the market now than we did 2 months ago. The market has not absorbed the extra inventory, which has put pressure on home prices. Prices have been stagnant for 2 years. In fact, home prices in October were less than January 2017 numbers. 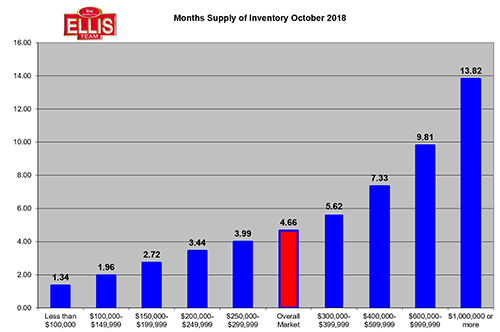 Official November numbers won’t be released until after this article was written, however we fail to see how rising inventory will help home prices rise when they weren’t rising with low inventory numbers. In the last 6 months we’ve met with many potential sellers. They just didn’t like the numbers they were seeing and wanted to wait until season when they thought they could fetch a higher price. Some even listed with other Realtors who listed at a higher price, and they’re still on the market. We always tell sellers, if you list with another Realtor for a higher price and it doesn’t sell, give us a call when it expires, and we’ll be glad to look at it again. The issue is for some sellers, their price has gone down. By listing it too high in a stagnant or declining market only adds to the pain later on. It’s much better to price it correctly the first time. Interviewing Agents. Ask pointed questions. It’s OK. How many homes did you sell in 2018? What is your company market share? How much commission will you pay out to other brokers in MLS to also show my home? If the agent cuts their commission upfront, it not only tells you how well they’ll negotiate your sales price, it also tells you how motivated other agents will be to show your home. How long have you been selling real estate? What’s your experience in a shifting market? Select the best marketing plan. Will your home be marketed in print and online? We’re not talking about putting it on Zillow and Realtor.com. Everybody does that. How will your home be targeted to specific buyers throughout the US and Internationally? Ask them to show you. It will become apparent quickly if they know how to do this, and if they do it. If you’re unsure, ask Brett or Sande to come in and show you. There’s a reason why our listings sell when others don’t. 2019 will not be the market to select an agent that doesn’t understand how to go find the buyer online. Correctly Price. It won’t matter how much your agent spends on advertising if it’s overpriced. Advertising exposes your home to the market. We think we expose your home to more and better buyers than anybody else. That’s a moot point however if your home is overpriced. Working with an experienced agent is critical in selecting the best price for your home. You may not like what the market is telling you but ask yourself this question. If I don’t like what the market is saying today, how will I feel in 6 months or a year when it failed to sell and you’re competing with more inventory then? Sometimes reality today is worth more than reality down the road. It’s all when you choose to see it. It’s right there in front of us. 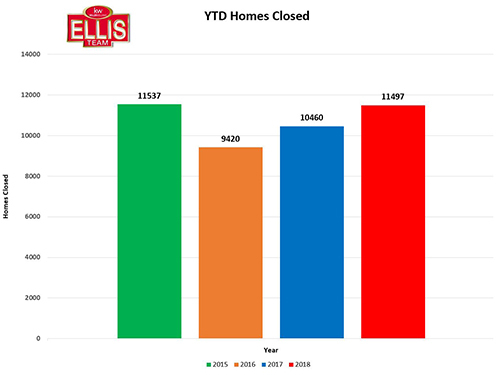 The Ellis Team has a plan to get your home sold quickly, and for Top Dollar! 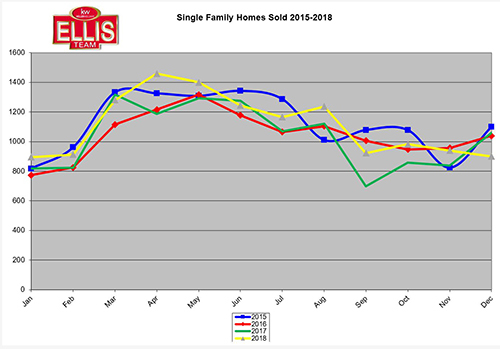 While home prices may be lackluster, 2018 local home sales are still at a near record pace. With YTD data compiled through October we see 2018 better than both 2017 and 2016 numbers, and only slightly behind 2015 numbers. November was a strong month, so when official numbers are released later in December, we believe we may even close the gap a bit heading into finishing out the year. We hear so many agents talk about a shift in the market. We can’t rule out what may happen in the future. All we can do is discuss what is happening now. Right now, we haven’t seen a shift in pricing or sales numbers. There may be another kind of shift we’ll discuss later. Home prices have been flat since January 2017. Today’s prices are roughly what they were 2 years ago, and they really haven’t changed much over the last two years. While the rest of Florida and the country have appreciated, Lee County has not. We don’t see a significant bubble ahead because of this fact, and because this market is different than the last bubble. We have end users for homes. In 2006 we didn’t. We have pressure in the market. Interest rates have risen which has lessened affordability for buyers. The pressure is simply market forces exerting itself on the market. Pressure will influence direction, and not necessarily change it. In other words, pressure can limit growth without causing negative pricing. If you add enough pressure, it can. Pressure can come from a variety of sources. Interest rates, wages, economic growth, unemployment, tourism, politics, taxes, supply, demand, and many more. When you throw them all in the crock pot, its fun to see which ones win out. We can predict, but forces are always changing in intensity and scope. Sometimes in business the numbers don’t change, but the way business is conducted does. When Amazon entered the market, physical retailers may have sold less, while online sold more. Overall sales could have been more or less, but it was certainly less for the physical retailers. The same can be true in real estate. We could have the same number of transactions, but agents accustomed to doing a certain amount may feel like the market has shifted because their numbers are down, when it really hasn’t. Real estate is changing. Sellers aren’t always reaching out to agents who have a track record of selling homes for more money, and faster. Sellers are selecting agents by who called them on phone, who they saw online, or at an open house they attended. It’s harder and harder for consumers to know which the really good agents are. Some of the really good agents are scratching their heads and wondering where the business is going and wondering why consumers aren’t contacting them as much. Advertising that used to work 10 years ago may be less effective today. The point I’m making is agents can’t judge the health of the market by how their own sales are going. Just because an agent’s sales are up 20% or down 20% doesn’t mean the market is. The Ellis Team is up big time in 2018, and yet we realize two things. We must keep adapting or we’ll get run over, and we have to keep our eye on the local market and look for changes. Change is inevitable. It’s like raising a child. Perhaps you’ve done a great job and your kids are great at 12. They’re not fully done yet, and you must keep it up for many more years. Things can change quickly if you don’t stay on top of it. The market may be balanced today, and move in a year or two. Forces change, and so will the market. Always call the Ellis Team at Keller Williams Realty Fort Myers & the Islands with your real estate questions. If you’re thinking of selling, ask for Sande or Brett 239-489-4042 Ext 4 Or visit www.LeeCountyOnline.com to sell all the homes in MLS and find your piece of paradise. Posted in Cape Coral, Cape Coral Real Estate, Fort Myers, Fort Myers Beach, Fort Myers Real Estate, Lehigh Acres, Southwest Florida Real Estate. Everyone seems to ask how the market is doing. Usually the answer depends on where you live, price range, and several factors. It’s not always as cut and dried because within the overall market we have several sub-markets that fluctuate independently of each other. Here are Southwest Florida October Housing Statistics by City. We decided to release some numbers we look at each month. One of these metrics is the breakdown by city. Before we discuss the numbers, we must first be careful not to read too much into one-month data. If a city has a low number of sales each month, the data can fluctuate wildly any given month. Secondly, in 2017 we were impacted by Hurricane Irma. In some cases, it hurt sales last year, and in others it increased sales last October because they were delayed from September. Since all that is out of the way, here we go. Bonita Springs led the way with a 43.9% increase in closed sales, but again, it’s a small data set. Sanibel/Captiva slowed the most followed by Estero, again with small data sets. Moving over to price changes, Sanibel/Captiva led the way with a 59.7% increase in median price. This might explain why fewer sales, although we think it has more to do with the mix that sold that month. 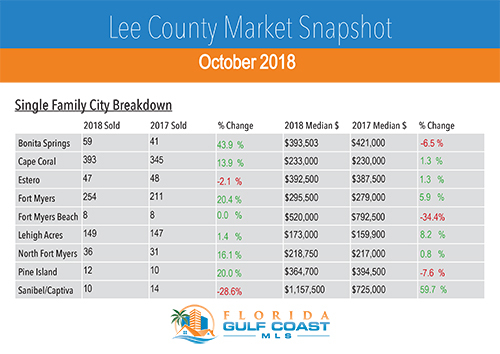 Bonita Springs, Fort Myers Beach, and Pine Island saw price decreases while the rest of Lee County saw mild to moderate increases. Fort Myers and Cape Coral did particularly well given that each has a large data set, and both scored gains in closed sales and pricing. Lehigh Acres and North Fort Myers were the only two areas besides Fort Myers and Cape Coral to record gains in pricing and sales activity. A lot of people made a big deal about water quality and how it affected home sales. By the numbers, it didn’t seem to harm Fort Myers, Cape Coral, North Fort Myers, or Lehigh Acres. Did it hurt Fort Myers Beach, Sanibel/Captiva, Pine Island or Bonita Springs? Possibly, but the numbers are mixed, and again it’s only one-month data. We have a section on our website www.LeeCountyOnline.com where you can search for homes by city, neighborhood, or even get neighborhood market reports. We have several neighborhoods setup and saved, and you can create your own as well if you don’t see your neighborhood listed. The neighborhood market reports are nice because they show you active listings, pending sales, and sold listings along with data and photos of each. You can signup to have these reports emailed to you monthly, bi-weekly, or weekly. These are different than neighborhood saved searches in that they contain much more data. Saved neighborhood searches can be emailed to you daily. Market reports can only be emailed weekly or greater because of all the extra detail. We provide more data than any other website we know of, and yet there is no substitute for speaking with us if you’re considering making a move. The data we provide is Free to use. We hope it helps you in making the best decision for your family. Sometimes it’s the experience, wisdom, and marketing behind the data that matters. These homes don’t sell themselves. Even when people think a home sells itself, there was still marketing involved to expose the buyer, negotiating the contract, inspections, etc. A lot goes into making a transaction come together. Most people don’t realize only 4% of prospective buyers can buy. They need help, perhaps selling another property, getting financed, etc. This is where agents come in, and experience matters. If you’re looking to purchase, sell, or both, you should call the Ellis Team at Keller Williams Realty. 239-489-4042. We don’t sell anything. We listen, educate, and help you achieve your goals. Posted in Cape Coral, Cape Coral Real Estate, Fort Myers Beach, Fort Myers Real Estate, Lehigh Acres, Southwest Florida Real Estate. There is much debate about the local SW Florida real estate market and whether it is shifting. Experts speculate that it might because of everything from rising interest rates, rising prices, housing declines up North, to climate change. This makes selecting correct listing agent critical when market shifts even more important, which we’ll discuss later on. One of the factors some experts look at when evaluating the market is housing inventory. New listing inventory numbers were just released, and we noticed a few things. First off, new listings increased 11% in October over 2017 new listings. Secondly, current listing inventory stands at 5,823 which is 17.9% increase over last year. So, what is causing this inventory buildup, and what can we do about it? Inventory buildup is caused by several things including rising rates, decreasing home affordability, and false expectations. Sellers read that home prices are up 2.9% over last year, so they add 2.9% to the figure they thought their home was worth last year, and voila, they have a number. Different homes appreciate at varying rates, just like certain neighborhoods appreciate at different rates than others due to location, age, the finances of the association, amenities, etc. Most sellers believe we have a runaway market while many buyers are fearful that prices are too high and should come down. The truth is both could be right, and both could be wrong, depending on the price range, neighborhood, and other factors. In a shifting market, two things sell homes. Marketing and Price. Sometimes a correctly priced home won’t sell or won’t sell for full value if it isn’t marketed well. However, history is littered with examples of overpriced merchandise that won’t sell no matter how well it’s marketed. Marketing and pricing go hand in hand. Other factors influence showings, like pet smells, kitchen and bath updates, the general condition of the property, etc. It all comes down to price though. What you have in it doesn’t necessarily affect value. For instance, I was in GA at a real estate conference and they drove me by Evander Holyfield’s home. I think they said it was a $30 million home to build, and it was in an area of acreage and homes worth a few hundred thousand dollars. If Evander would have sold that home back then, there is no way he’d get $30 million, even though he may have had that much in it. Who would buy it? While that’s an extreme example, the same principal holds true. Cost does not equal value. If you want to sell, we must determine what the market is willing to pay. It doesn’t matter how much you have in the home, how much you need to buy your next home, or how much you owe. It’s just worth what’s it worth at this point in time. Some sellers decide to wait until it goes up in value. That’s fine if they realize it could go down in value too. And, while they’re waiting for their property to go up in value, the thing they were going to buy with their proceeds might go up in value too. What if it goes up faster than the home their waiting to sell? They lose money by waiting. We’re not here to talk sellers into anything or convince people to sell. We do offer common sense solutions, and present ideas for them to keep in mind so they can make the best decision for their finances. Buying and selling can be emotional, so they tend to have knee-jerk reactions. Once buyers or sellers get an idea in their head, it’s hard to come off that. That’s where a seasoned professional with years of experience comes in. It’s one thing to know the market, and it’s another to know how to deliver information to buyers and sellers in a format they can digest to make good decisions for their family. If you’re thinking of buying or selling, call Sande or Brett Ellis 239-489-4042 and we’ll help you with your questions, or go to www.SWFLhomevlaues.com to find out your home’s value for Free online. Posted in Cape Coral, Cape Coral Real Estate, Fort Myers, Fort Myers Beach, Fort Myers Real Estate, Reflection Lakes, Southwest Florida Real Estate, Waterfront Homes.